*** most of the pictures in this post were taken by Anete with her 35mm film camera. Los Angeles is steeped with music history, whether you are talking about hip-hop, rock, metal or most other genres really. Our combined tastes mostly gravitate towards the rock and metal world, compelling us to make a list of absolute music meccas we had to see. Below are some of the places we visited. If you consider yourself a music lover of sorts you’ll find some points of interest here. 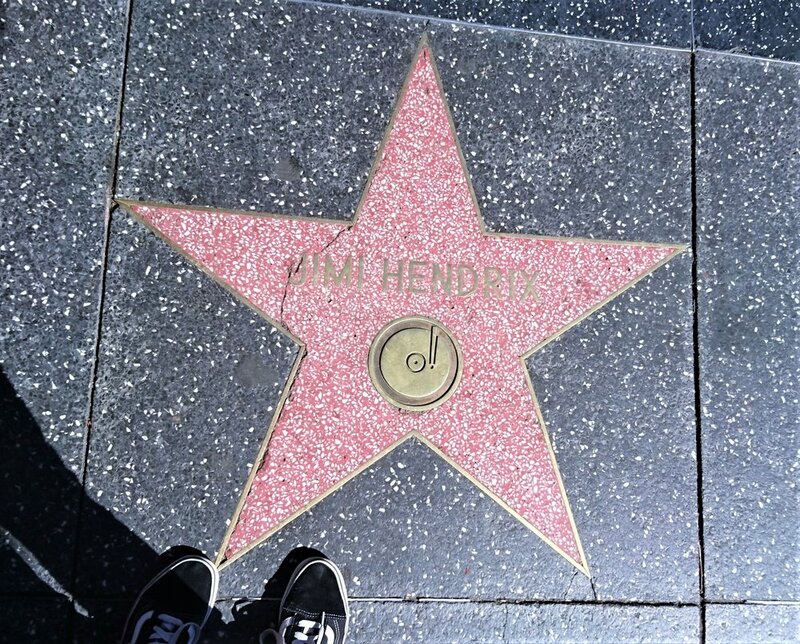 First off, the most obvious place - the Walk of Fame - you’ll find names of many music greats, but if you look up, you will spot the Capitol Records Tower on the intersection of Hollywood and Vine. Built in 1956, it was the first circular office building in the world, and possibly the only one so far that resembles a stack of records. Another designy fun fact - the spire’s blinking light on top of the tower is constantly spelling out ‘Hollywood’ in Morse code ever since the building was unveiled. The idea of Alan Livingston, the then-president of the company, was to advertise Capitol as the first record label based on the West coast in this weirdly subtle way. Capitol Records Tower has seen many music legends walk through its doors - Frank Sinatra, Nat Cole,Tina Turner, Iron Maiden, Prince - to name just a few - all of whom contributed some of the greatest masterpieces in the history of music by recording in the famous Capitol Studios. A lot of music scores for feature films have been created here as well. Just outside the building is a beautiful mural named "Hollywood Jazz — 1945-1972", dedicated to such greats as Ella Fitzgerald, Billie Holiday, Nat King Cole, Miles Davis and Chet Baker. Painted in 1990 by LA artist Richard Wyatt Jr and recently refurbished, it was initially supposed to be a temporary display but quickly became a landmark in itself, now preserved as a part of the city’s cultural history. 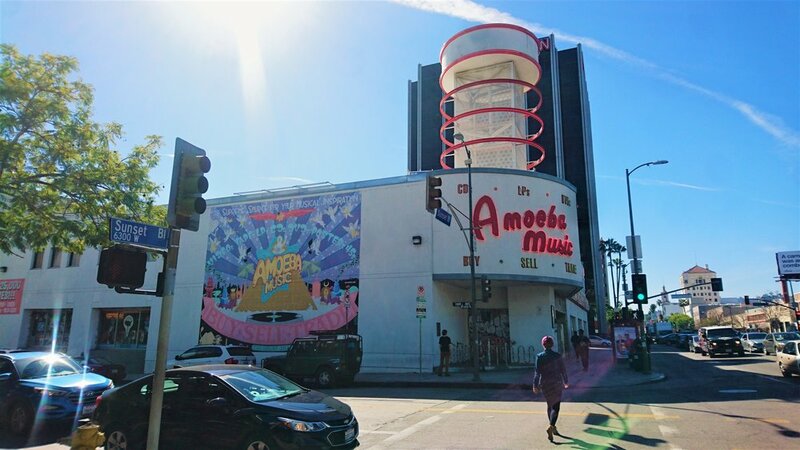 Moving on to 6400 Sunset Boulevard, Amoeba Music is an independent US record store chain, with two more shops in San Francisco and Berkeley, the latter being the first location, opened in 1990. 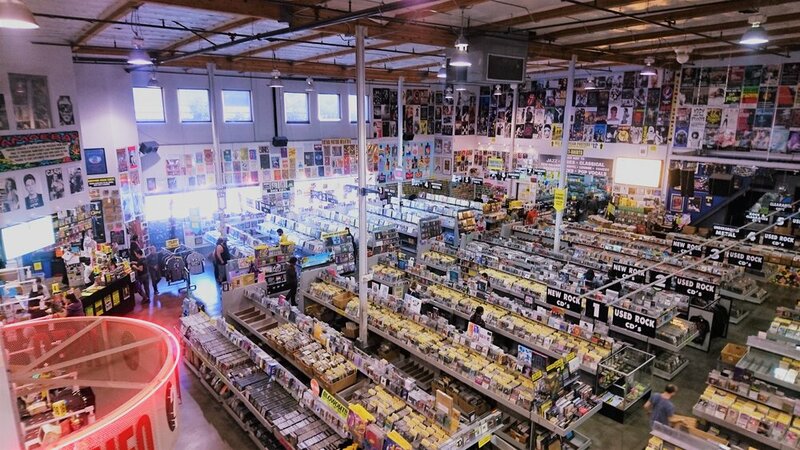 This is the best place to go crate-digging in LA. You will find music in all formats, new, old, used and some occasional rarities. The rarest - and most expensive - vinyl sold in Amoeba’s history was a test pressing of Bob Dylan’s Blood on The Tracks, of which only 4 copies are said to exist. You also might get overwhelmed by the sheer scale of the place, especially considering its independent status. Sadly, the property has now been sold to developers to be converted into yet another luxury glass tower...although it will remain in its Sunset Boulevard location for several years, until the end of its lease. So go visit while you can and remember that supporting independent records stores is a great way to support both a local business and your favourite artists, so spend a few bucks if you can. As far as legendary music venues go, the Sunset Strip in West Hollywood has a fair share of places that have attained such status. The Roxy venue & nightclub has hosted many musical greats ever since opening doors in 1973 and continues to do so, providing an intimate atmosphere with only 500-people capacity. It has been a regular hangout and place of debauchery for too many artists to list here. Let’s just say this is where Bob Marley and the Wailers performed, Prince toured his debut album and The Ramones played their first California gig. As stated on their website, the people behind the creation of the Roxy intended ‘to open a state of the art venue where artists of all musical genres felt at home’ and it’s fair to say the venue continues to succeed at that today. We got there the first night we arrived, bleary-eyed having not had any sleep on our 11 hour flight from London due to all the excitement. 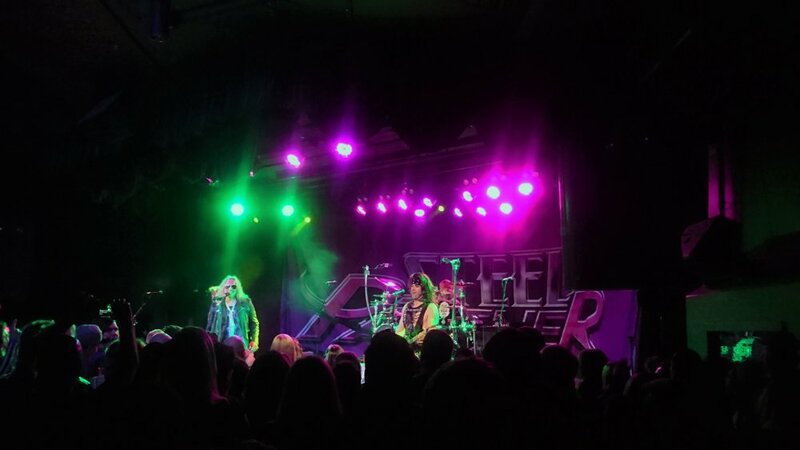 Whether it was Steel Panther, who were playing that night, or the jet lag but we couldn't fully comprehend that we had actually landed on the Sunset Strip in 2017 as it might as well could have been 1987. And that's the LA magic. 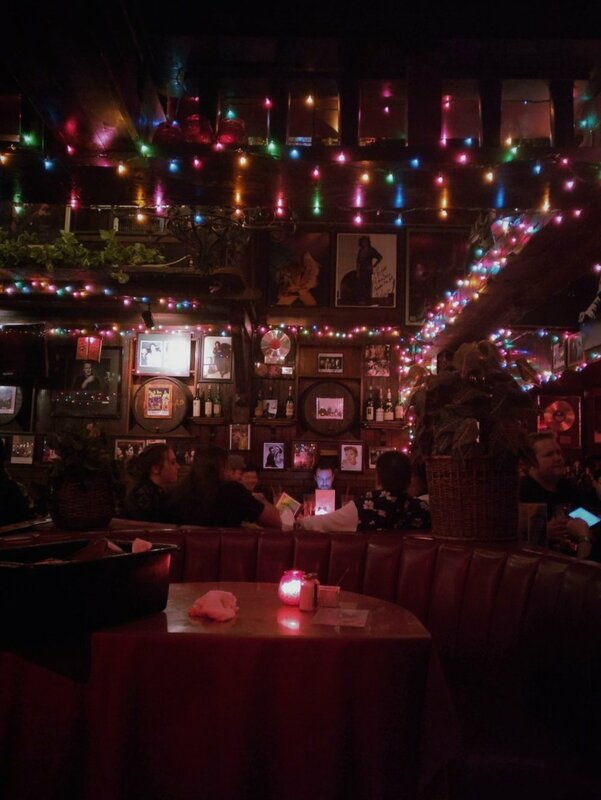 Just next door is where you might have caught Lemmy sipping Jack Daniels just a few years ago - Rainbow Bar & Grill. Now you can have a drink in the outdoor area aptly named ‘Lemmy’s Lounge’ next to the monument built in his memory. Going to Rainbow really feels like stepping into music’s history. 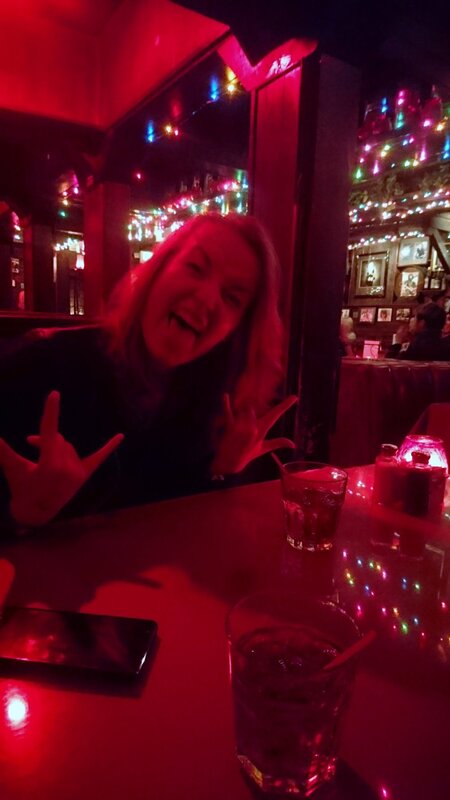 Photos and memorabilia are plastered all over the walls and dark and red lighting gives out the feeling that it really could be any decade or time of the day - the only constant that exists is rock and roll and endless glasses of whiskey. This is also where we spent about the amount that was supposed to last as for a whole week on the first night. No regrets. Whisky a Go-Go is another famous venue a few doors down. It has been inducted in the Rock n Roll Hall of Fame considering its status as a music landmark. Whisky has been important in launching many careers. If you look at the timeline of recorded music history, a lot of front-runners of music’s major movements performed at the Whisky. The Doors were the house band here in the 60s, 70s saw The Ramones and Blondie take the stage, Mötley Crüe and Guns n Roses took up residency in the 80s, Seattle based musicians such as Soundgarden and Mudhoney brought in the grunge in early 90s and so on. We walked past Whisky a Go-Go on our second to last day in LA. We were broken from all the exploring and also very broke so it was literally either we eat or buy tickets to see a show. The venue was on our must-do list, but after realising that food should probably be a priority, we were sadly resigned to strolling past and taking some pictures...that’s when the mom of one of the musicians performing that night gave us free tickets. Out of nowhere. We were so excited and ecstatic to score a free gig in such a legendary place that we completely forgot the name of the band. If anyone knows who played the Whisky on the 18th of March 2017 give us a shout! They were great! This was unfortunately also the day Chuck Berry sadly passed away, and the band did an amazing tribute to the late artist by performing Johnny B. Goode.